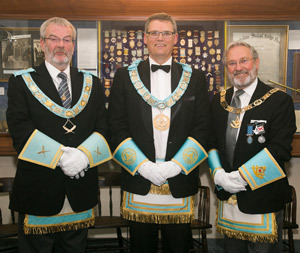 Flanked by the Grand Secretary, Rt.W.Bro. Barry Lyons (L) and the Most Worshipful Grand Master of the Grand Lodge of Ireland, Douglas Grey, Rt.W.Bro. Andrew McGregor became the 15th Provincial Grand Master in New Zealand. October in Central Auckland, and the wet shining streets of the city mirrored Jack Vettriano’s oil painting ‘The Singing Butler’ as, crowned with umbrellas, a zigzag ribbon of dinner-jacketed men, escorting ladies swathed in flowing, colourful evening attire, battled the elements to rendezvous at Lodge Ara. 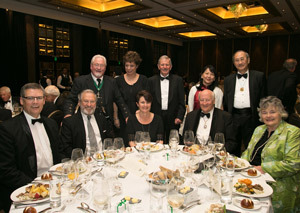 The black-clad Brethren were on course to witness the most major changing of the guard to affect Irish Freemasonry, in New Zealand, for one and a half decades. The Provincial Grand Master of the Irish Constitution, Rt.W.Bro. Roland Whyte had made the decision to step down. As he announced, “I decided to quit while I was ahead.” Bro. Whyte has a droll sense of humour, or can be quite flippant as takes his fancy, but glib or not, this remark could not have been more accurate as, when he relinquished his post, Brother Whyte was at the top of his game. Rt.W.Bro. 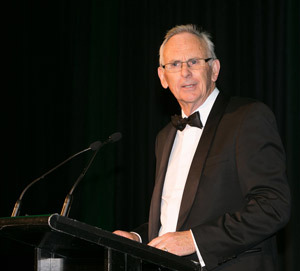 Roland Whyte addresses a large audience in Auckland’s Langham Hotel. He was retiring from the role of Provincial Grand Master; a post he held for 15-years. When not on duty he is known to all simply as ‘Roly’, yet when he enters any room Brother Whyte exudes a palpable presence. His demeanour is never overbearing, but commands attention. He goes about his work with an air of authority, joined with a quiet confidence that is somehow infectious, inspiring confidence in others. A leader in the mould of an Eisenhower, Rt.W.Bro. Whyte is as comfortable in the role of politician (bringing opposing parties together and alleviating agitated situations), as he is at making weighty decisions. Later in evening, he told his audience, “There is no manual for being a Provincial Grand Master. You simply have to grow into the role - and sometimes you learn by your mistakes.” All who have met him can attest that he knows the role well. Roly Whyte is a frequent visitor to Masonic events across all four constitutions in New Zealand, and to sister constitutions around the world. This is unlikely to alter since, due to his disposition, he graces any ceremony or social event with wisdom, social etiquette, and a ready wit. In consequence, he is highly regarded wherever he goes, and his presence is a sought-after commodity. Following the opening, distinguished officers from the Scottish, English, New Zealand, and Irish Constitutions were admitted. The ceremony proceeded smoothly enough, in spite of the odd hiccup brought on no doubt by nerves, and which provided some jocularity rather than admonishment. A procession was formed and the Provincial Grand Master-designate V.W.Bro. Andrew Gareth McGregor was paraded in view of the many Brethren. He looked relaxed and comfortable in the role as he was duly Obligated according to ancient custom. The Grand Master of the Grand lodge of Ireland placed Bro. McGregor into the Chair of King Solomon and, rightly, the Implements of Office were presented to him by the Past Provincial Grand Master, Roland Whyte. Granted permission to speak, the newly Installed PGM thanked all the Brethren for their attendance, noting especially the long air journey made by the Grand Master and Grand Secretary. He praised Rt.W.Bro. Whyte for his unstinting help, and for his “careful guidance and exceptional leadership” of the Irish Constitution across 15-years. As the finale approached, nineteen Brethren received promotion or recognition for their contribution to The Craft, including six from Lodge St. Patrick. The most notable being Rt.W.Bro. J.F.T. ‘Frank’ Griffin. (Who had in actuality, been promoted to Provincial Deputy Grand Master earlier in the year.) It was a worthy reward for his many years of unsparing effort within Masonic circles, and elsewhere in the community. A Fellow of the Royal Society of New Zealand, and another Freemason with ‘presence’, Frank is a gifted speaker with a booming southern Irish accent. He owns a keenly honed sense of humour, and frequent roars of laughter invariably attest to his skill as an after-dinner speaker. 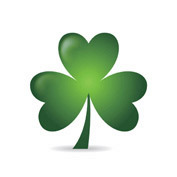 Lodge St. Patrick is proud of him, not least due to his many world-acclaimed achievements in the field of research into respiratory diseases in large animals, in his role as Professor of Immunology and Microbiology at the University of Otago. Guest of Honour at the Installation was the Grand Master of the Grand Lodge of Ireland, Douglas Grey. Hardly surprisingly, the closing address was made by the Grand Master, who emphasised the importance of educating new Freemasons through mentoring, thus enabling them to better understand the tenets of The Craft, and what is expected of them as a Freemason in modernsociety. M.W.Bro. Grey decreed that they should be introduced to other Lodges and Constitutions, and explained why they should learn about other people’s ideology and even anti-Masonic views. He described how both he and his predecessor M.W.Bro. 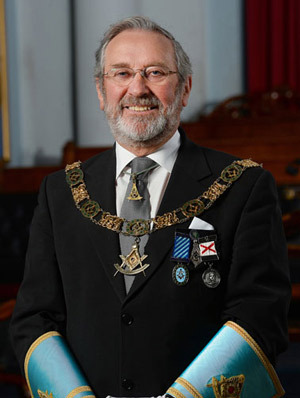 George Dunlop, Past Grand Master, have striven to make Freemasonry in Ireland more open to the public, especially to sceptical factions and to the ever-inquisitive media. As a consequence, the additional publicity derived has had a galvanizing effect on the general public; for a special event Dublin’s Freemasons’ Hall became THE most visited building in that city, attracting upwards of 4,000 visitors during the day. As a postscript, M.W.Bro. Grey announced to the pleasure of those assembled, that Rt.W.Bro. Roly Whyte had been made honorary Junior Grand Warden of the Grand Lodge of Ireland in gratitude for his outstanding, and global, contribution to Irish Freemasonry. At any Installation there is much to be completed, especially one of this magnitude, the organising officers, however, kept it to a sensible length. The Grand Lodge officers retired together and the Lodge closed in peace and harmony swiftly thereafter. Following the ceremony a small function had been organised for those visitors who could not remain. In the original ‘Master Plan’, it was intended that this get-together be a small affair and that guests be simply fed and watered, prior to departure. The crowd, however, had other ideas. Visitors, Lodge members, wives, partners, et al, appeared most enthusiastic to attend this rendezvous to greet-and-meet. The expected ‘quiet event’ metamorphosed into a party all of its own – and what tremendous impromptu fun it was too. Auckland’s Langham Hotel is the epitome of classic elegance; a fitting venue for the celebrations that followed the Installation of the Provincial Grand Master. The pre-dinner drinks function in The Langham’s Great Room reception was bursting; the sounds of old friends being greeted, new friends being made, and laughter and merriment permeating the room - a very convivial soirée. The celebration banquet was a lavish affair, and rightly, recognising the visit of the Grand Master and Grand Secretary, welcoming the incoming Provincial Grand Master, and thanking the out-going PGM for his extensive service to Irish Freemasonry. In his exit-speech Roly Whyte did not disappoint, delivering a broad address, tinged with sadness, but also interlaced with witticisms, to an appreciative audience. He acknowledged comprehensively the many people that had been at his side throughout his amazing journey reserving, until last, his heartfelt thanks to his wife, Susan. Then came the turn of the new Provincial Grand Master: Andrew McGregor spoke with conviction. He thanked those for having confidence in him and for bestowing upon him this high honour while, with humility, he recognised the many unsung people hiding in the background, responsible for organising such a momentous event. The final accolade though he saved for his father, who he praised unreservedly, firstly for introducing him to Freemasonry, and secondly for his father’s unconditional love and support during his steady climb through Masonic ranks. Andrew’s father V.W.Bro. Peter McGregor had not been enjoying good health; nevertheless he had obviously drawn heavily on his reserves to be on-hand for his son’s Installation as the fifteenth Provincial Grand Master for the Province of New Zealand and, subsequently, to attend his celebration banquet. It was obvious that Peter was moved by his son’s profound gratitude, and his achievements, it was also clear that there was absolutely no way he would have missed any of it for the world! The celebration banquet at The Langham was a well-patronised affair. Rt.W.Bro. Andrew McGregor (LEFT FRONT) is pictured with the G.M. and several distinguished officers and their partners. The banquet in The Langham Hotel was a culinary delight, and the service superb. The activity of those waiting-on-table was the quintessence of polite, graceful efficiency; any guest’s need being attended to in a trice, while a diner’s empty wineglass miraculously became full again – The Langham might be haunted by wine-ghosts. The staff and their mentors are to be congratulated as any visitor to “The City of Sails” would be impressed by this establishment’s refined sophistication and impeccable service; the epitome of 21st century chic. The Provincial Grand Master, Rt.W.Bro. Andrew McGregor is well aware that he has to live up to a huge reputation. Nevertheless in his new role he will be able to draw readily on Roly Whyte’s expansive experience, while Provincial Grand Lodge officers of very high calibre surround him. Intelligent and articulate, Andrew possesses one trait though that is probably most important for one in such a principal position – he has a lively sense of humour. Andrew is an advocate of organic change, but no one should balk at this because without change, there is only stagnation, and for Freemasonry to survive in the new millennium, stagnation is not an option. Bro. McGregor always has been a keen visitor to other Lodges and sister constitutions; he has been a regular attendee at Lodge St. Patrick’s meetings for instance, and St. Patrick is hardly a near neighbour. Under his watch therefore, it is evident that the Irish Constitution will be well represented. For Irish Freemasonry in New Zealand the future looks bright.